Django 1.11 is Django's official current Long term support release - so when you create a new Django project on Divio Cloud, it's the version we provide by default. It's a sensible choice, including for users who are exploring the Divio platform. Tutorials and code snippets in our documentation are therefore also based on Django 1.11. But what if you want to use Django 2.x features in your project? Django 2.x is of course already available and following the recent Django 2.2 beta release, we just released Django 2.2 beta 1 in the addon beta channel and it's available now! Django 2.2 is a significant release and will be given LTS (Long Term Support) status on release. At the time of writing, the Django Project's goal is to release it in stable form in April 2019 and provide full support until at least April 2022. With the alpha now available, you can start planning for any deprecations and API features in good time. Before we get started, the changes in Django 2.2 are well covered by the extensive Django Project change log and are well worth going through for possible deprecation and other changes before you get started. Let's get going by creating a new project in the usual manner with the choice of Python and Django project templates. Note that Django 2.x supports Python 3.5, 3.6 and 3.7 so be sure to select Python 3.6 in the initial project setup to save needing to tweak Python version. Choose a suitable plan for your project needs and your new project will be created and ready to go in a few moments. You can access extended settings using the 3-dot icon to the right of the choices and select Versions from the drop-down. Available versions are ordered into stable, beta and alpha channels accordingly. 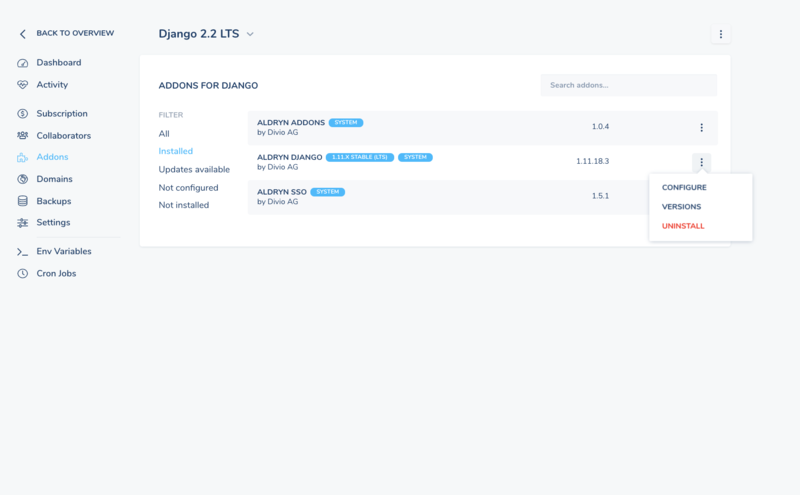 As an initial alpha release, reflecting the official alpha status, you can find Django 2.2 LTS alpha in the alpha channel. Select 2.2.0 alpha 1 and confirm your changes to apply the update. Your project will be automatically upgraded to your chosen version as soon as it is next deployed. 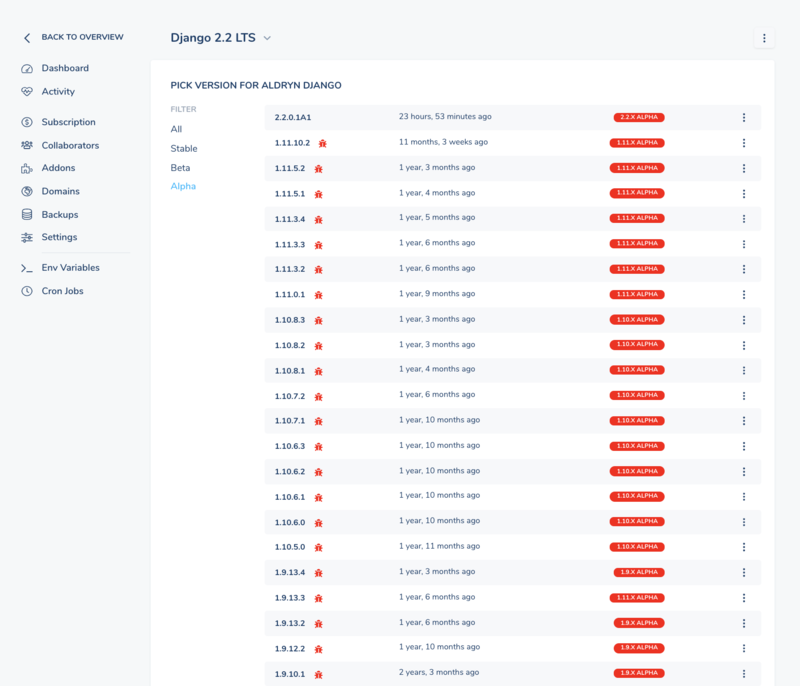 By using the Divio Desktop tools, you can immediately start trying out Django 2.2 and deploy your projects to test and live servers in the usual way. 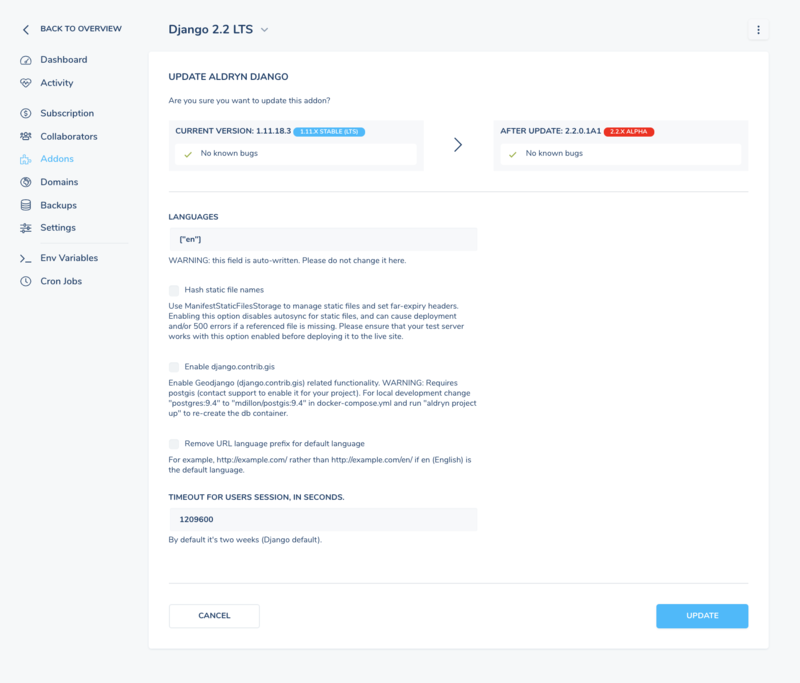 With Divio container-based hosting, you can conveniently work on evaluating new versions without needing to make changes to your working environment. Quick tip: want to quickly smoke-test your project with Django 2.2 or any other version? 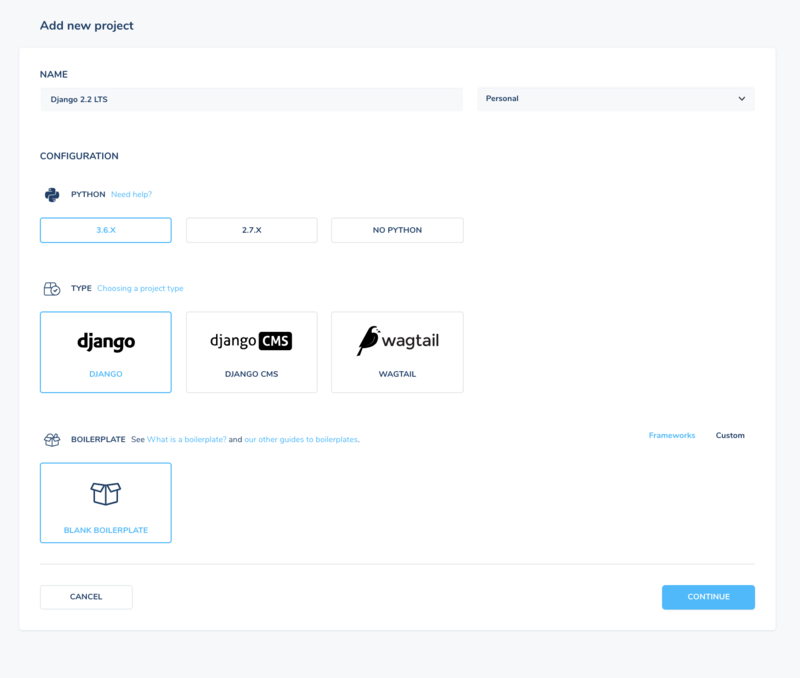 You can easily clone an existing project, perhaps using Django 1.x or 2.x, from the Divio Control Panel and then adjust versions and test accordingly with no disruption to your existing project. Simply go to your project overview, find your project and select the 3-dot icon for extended settings and select "Duplicate". Now you have a perfect clone and can explore new addon versions at will!